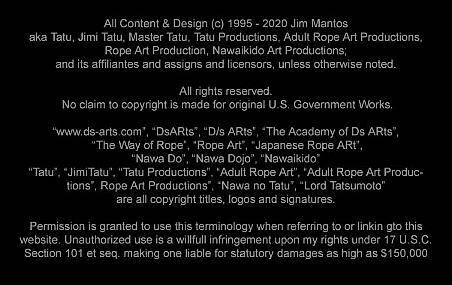 Nawa-aikido style rope developed by Tatu uses breathing techniques to help focus the energies to blend together with your partner to become one nature, your environment, in harmony with all things. This breathing is done to help prepare the way for rope master and jujuun to transcend the boundaries of time and space, to take her on an inner journey of pleasure. In Japan "Breath Meditation" is called "kokyo-ho". To be in tune with oneself and with others begins and ends with the journey of breath. To breathe is to live, to live is to breathe. Our very existence starts with exhalation. This is called the shout of life. A new born's first sound is as he exhales a scream into his new world. When breathe stops, our journey comes to an end. As long as Kokyo exists and is deep and steady, our lives flourish. Kokyo is not simple breathing. Good breathing requires an insight into our existence and the application of principals of life. To breathe correctly one first must learn to sit correctly. One sits in a manner which martial artists call, seiza. Seiza is sitting on ones knees and ankles with the distance between each being about equal. The right big toes is crossed over the left. Sit up straight and pull the chin in. You should have your center of gravity over the triangle formed by your legs and feet. Here the bondager kneels or sits behind the rope submissive pressing his chest to her back and wrapping his arms around her. She will feel his chest rise and fall, she will pattern her breathing with his. This is a binding of loving energies around her. It initiates an energy of trust, as if her very breath, her very life is now in his hands. He helps her focus on her center (ki - harmony) and may speak softly into her ear; guiding her on a meditative journey as their souls merge as one.